FF stand for Forced Flue. The Pipe-in-pipe-forced flue venting system is a unique advanced heating system. The outside pipe of the venting system brings in cool outside air for combustion while the inner pipe exhausts all combustion by-products to the outside. In process, the room air is heated by the heat exchanger to the outside and the large circulation fan distributes clean heat quickly and evenly. 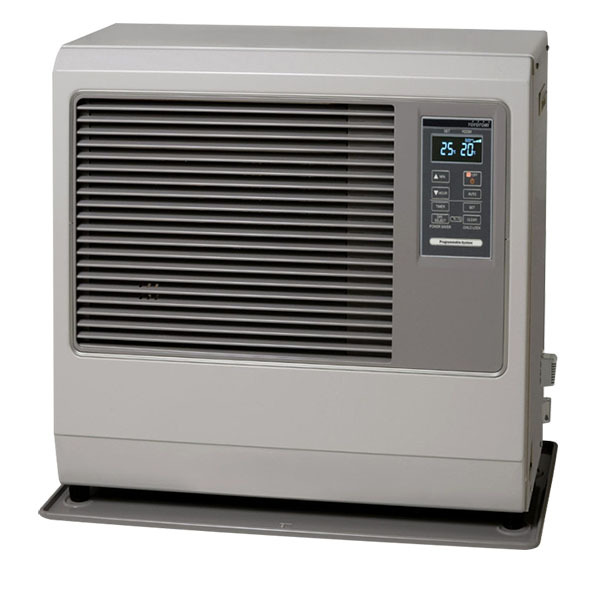 The result is smokeless, odorless, clean, safe and high efficiency heating. The venting system is easily and directly installed through the wall, wether it be wood, brick, masonry or even metal as found in industrial buildings. The unit also features automatically shut-off safety system. The FF-heater is one of the most fuel-efficient heating systems in the world today. Its special stainless steel heat exchanger offer 92% fuel efficiency. It gives you all the convenience of a central heating system. The special efficient and economical heat exchangers made of stainless steel outperform oil and gas systems, and are more economical than wood burners and electric heating. The heater cuts out automatically if it fails to ignite or if a problem occurs with the flame during the combustion process. This prevents fuel leakage. An error code then appears on the digital display. The heater cuts out automatically when the heating chamber gets too hot. The cycle fan circulates the clean and pleasant heat quickly and evenly throughout the room. The fan power is set automatically. If the room temperature exceeds the desired temperature by, for example, 6°C, the appliance cuts out automatically. It then automatically reignites once the room temperature has fallen below the desired temperature again. This saves energy. This gives you an overview of all the heat functions, the current temperature and much more besides. In the event of a power failure while the heater is on, the appliance will switch off. It will then reignite automatically when the power comes back on. The flue pipe brings outside air in to maintain combustion and takes the combustion products and emits them outside. With the integrated weekly timer, you can programme up to 30 different times of your choosing, 24 hours a day and seven days a week. Automatic cleaning is performed once the heater has been running at the maximum setting for more than two hours. This process takes five minutes. During cleaning, the appliance runs at its lowest setting, then automatically reverts to the maximum setting upon completion of the cleaning process. This button locks all other buttons with the exception of the on/off button. Tronex is a wholesale dealer in Return Goods and overstocks. We mainly buy and sell return goods but also provide services as: Refurbishing, repacking, relabeling, transporting and storing third party products.